For the last few years we have gone big for National Poetry Day [which takes place in the autumn each year], from working in partnership with BBC 1xtra and RoundHouse for Words First to producing our own film. Poetry is celebrated within our library service as a method of expression and learning within our culture and reading offer. 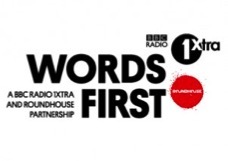 Words First is a partnership between BBC Radio 1Xtra and the Roundhouse that seeks to find the hottest and freshest spoken word talent from across the country. The partnership is supported by Arts Council England. Studio12 and Leeds Young Authors were chosen to host workshops and masterclasses in Leeds on the 5 to 9 October 2015. 62 young people applied from across the region and 13 young people were selected to attend the workshop. A week long workshop covering spoken word and performance was led by Khadijah Ibrahim and Testament hosted by Studio12. Visiting artists included Saju Ahmed, Zodwa Nyoni and DJ Target from 1Xtra. The week resulted in 13 young people performing their spoken word, written in 3 days, to a live audience of 90 people and broadcast from Leeds Central Library on National Poetry Day 2017. The week concluded with Denmarc Creary, selected and mentored by Studio12 and Leeds Young Authors, performing at the 1Xtra Live event at the Leeds Arena to 10,000 people, broadcast live on TV. 6 young people including Asma Elbadawi from Leeds received further training at the Roundhouse in London, with the likes of George the Poet and Kate Tempest and went on to perform at Words First Live. Check out the young people performing their poetry. In 2017 we wanted to produce a film that would be screened within the city on National Poetry Day. Librarians from across the city asked their writers’ groups for poetry submissions on the theme of Freedom. The submissions were shortlisted and 6 poets were taken forward for filming - Kim, Taiwo and Beccy from Studio12 and Roz, Chesh and Ian from writers groups across the city. Each poet was given a slot to attend Studio12 for filming against a green screen. We wanted to keep each poem to no more than 2 minutes, meaning filming and editing was easy and time efficient. If you want to do something similar but don’t have access to a film studio you could use a tablet and a film editing app. The film showcases the range of writing and the diversity of interests of our writers. The film was retweeted by National Poetry Day UK and shown on Leeds Big Screen (situated in Millennium Square) on the hour, all day. A snapshot is still showing on Facebook. We also decided we wanted to put on an Open Mic event after the success of the previous years. This took place in our beautiful Local and Family History Library. The event was very popular with over 24 poets from across the city performing their work, attracting an audience of over 40. We asked published poet Khadijah Ibrahim to host the event. People of diverse ages and background attended and a variety of subjects (some not suitable for young ears!) were performed. The event was inspiring and it was great to witness so many people passionate about their craft. Keep up with events in Leeds libraries by following them on twitter. Leeds are not the only ones to celebrate poetry - not just on National Poetry Day, but also on World Poetry Day (which took place on 21 March this year). At Jubilee Library in Brighton, or in any of the other libraries in the Brighton and Hove area, you could pick up a poetry book from one of their many displays. On the day in the Jubilee library, under 5’s and their parents/carers could listen to some rhyming stories and songs, and all the family were welcomed to come and listen to Poetry Time. This sort of activity I’m sure took place in many libraries around the country, but how many others hosted a poetry ambulance? In front of the library, in Jubilee Square you could visit the Emergency Poet and her Poetry Ambulance. It proved very popular, with a queue of people waiting to receive their poetry prescription. If you are in a library which ran an event for either of the Poetry celebrations, please share examples in the comments - we’d love to hear about them.